Tom Wyatt has discovered a cure for a fatal fish disease called gill fever. It�s worth a small fortune, so much so that Wyatt�s boss, Jack Huxley, claims the formula, since it was made in his company. Nora Huxley�s apartment in this episode is the same apartment that was occupied by Grant Reynolds in the previous episode, �TCOT Borrowed Brunette.� They have added different furniture, but the large plant is the same as well as the statuette of the bull on the table by the door. Submitted by PaulDrake33, 25 June 2008. Gill fever is an actual goldfish ailment. Submitted by Craig, 3/27/2010. Cecil Kellaway�s cousin is the accomplished Edmund Gwenn, who played Kris Kringle in A Miracle on 34th Street (1947). Kellaway was initially offered this part, but he turned it down. At least they kept in in the family! Submitted by gracep, 8/12/2010. Sightings: The ubiquitous Little Old Lady in a Hat quietly appears in the courtroom gallery next to Darrell Metcalf. Distinguished Gentleman #1 is in the back row near the door. Submitted by gracep, 8/12/2010. + The following day, the Gentleman reappears next to the Lady and behind the victim�s widow. Quiet Old Man #1 is also there to watch Burger play with some fish in court! Submitted by gracenote, 2/21/2011. Where's Lee? Another episode where the stoic Sgt. Brice is played by Chuck Webster. Still wondering why the homicide sergeant in the script wasn't given another name if Lee Miller wasn't available. Submitted by francis, 07/09/14. +Lee Miller plays a homicide police officer with Tragg. I guess he has not yet been promoted to Sgt Brice at this point in the series. Submitted by BigBill767, 2/4/17. Cecil Kellaway received credit on a card all by himself, the way Raymond Burr does throughout the series. (He was rather an important character actor at the time.) Only a few guest stars were honored in this way. Submitted by gracenote, 2/21/2011. Zoom! The director featured a lot of zoom shots in this episode including one on Myers as he walks in on Huxley and Sally, one on Metcalf as Huxley brings the fish mixture to him, one on Nora as she tells Myers to get out and even Perry gets a zoom as he objects to Burger's question to Tragg. And although not technically a zoom, after Rollins ends his phone conversation with Mason, he almost walks into the camera so that all we see is an extreme closeup of his tie. Submitted by Wiseguy70005, 8/05/12. 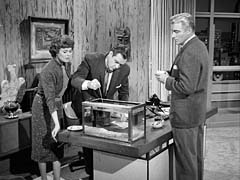 Jerry Goldsmith's Jazz Theme pops up again in this episode as Mason tests his fish mixture in his office and again as Metcalf testifies. Submitted by Wiseguy70005, 8/05/12. Syndication cuts: Huxley goes to Metcalf's office, drinks the whiskey, sees Huxley dead and phones Myers; scene with Perry, Paul and Della joined by Metcalf, Perry asking him who could have killed Huxley and Metcalf telling Perry of Huxley's women. Submitted by Wiseguy70005, 8/05/12. Closed-captioning: When the judge refers to "parlor games" in his discussion with Burger and Mason, the closed-captioning reads "power games." Submitted by Wiseguy70005, 8/05/12. + I should point out that the previous comment concerns the syndicated version's closed-captioning. The DVD's closed-captioning has the correct wording. Submitted by Wiseguy70005, 7/29/13. + In the third season's "The Golden Fraud" another shot of the door with "Thomas J. Hood" is seen at case involving a judge played by S. John Launer. On the other hand in "The Grumbling Grandfather" in the fourth season, a different shot of the door with the same name is seen but John Gallaudet plays the judge. Which (if either) is actually playing Thomas J. Hood may be impossible to determine. The name was apparently affixed to the door on the set (and on the fictional courtroom) no matter which actor (or judge) was presiding over the case. Submitted by Wiseguy70005, 11/03/14. When Lt. Tragg makes his first visit to the suspect�s house, he wistfully flirts with Della Street, uncharacteristically to the point where he forgets himself. Submitted by gracep, 8/12/10. That rogue Paul Drake! He stole Della�s coffee cup about 2/3 into the episode. He eats her sandwich, too! Submitted by gracenote, 2/21/2011. Why isn't this episode considered to be an official adaptation of a novel (The Golddigger's Purse)? Because the title character was dropped and the title had to be changed? Years later "The Mystified Miner" was officially based on The Spurious Spinster. "The Glittering Goldfish" certainly has as much in common with The Golddigger's Purse as "The Empty Tin" has with The Empty Tin. Submitted by Wiseguy70005, 7/29/13. Goofs: In two separate scenes, the actor's voice was heard without the lips moving. The first scene was at the office when Donna Sherwood comments about the Beta fish order. + "Miss" Sherwood isn't the one talking. Huxley is talking to Miss Wilson. Watch carefully. You can see him turning away from Miss Wilson in the next shot. OLEF641; 10/11/2017. Not to question the looks or acting of Murvyn Vye, who played Huxley, but his character doesn't look as though he has any interest in fish ... just money. I guess that's the point? Submitted by MikeReese, 8/26/2014. When Darrell Metcalf discovers Huxley's body, he seems genuinely surprised that Huxley is dead. Since no one else is present in this scene, Metcalf has no reason to be deceptive. Why is Metcalf surprised if he himself did the deed? Submitted by EricM, 12/13/09. + Probably the reasoning is that he may have been too drunk to remember his actions! Submitted by Wiseguy70005, 7/29/13. Supposedly Perry reaches his conclusion of who the guilty party is based on the fact that Metcalf drank from the glass with the lipstick leaving his prints on the glass. Maybe the fact that the other glass and the bottle are both empty might have something to do with that as well. Submitted by Wiseguy70005, 7/29/13. The Best Performance by a Guest Actor in Series History? : The great character actor Cecil Kellaway turns in a terrific performance as Darrell Metcalf, particularly during Perry's cross-examination of him. His regretful summary of his qualifications as a chemist is masterful, getting more out of the three words "Yes, I'm qualified," after summarizing his educational background, than anyone could possibly imagine. He manages to be both sympathetic and scary as he explains his motive for committing the murder. Submitted by BobH, 18 June 2016.